Russian President Vladimir Putin’s decision to skip both the G-8 and the NATO summits this month suggests he plans to delegate relations with the West as much as possible to his deputy, Dmitri Medvedev, while he concentrates his diplomatic efforts in the former Soviet republics of Eurasia and the emerging economic powerhouses of East Asia. Putin is a leading advocate among Russian leaders of deepening Russia’s Asian connections, and the Pentagon and the White House need to orient their Asian pivot properly to address Moscow’s new Asian orientation. With this in mind, trying to influence Russia’s relationship with China, particularly in the nuclear realm, is especially important, since Putin and other Russians see China as both an opportunity and a challenge. Some clever trilateral diplomacy on the part of the United States could exploit these differences to induce both countries to pursue more benign security policies in Asia and elsewhere. Russia and China have the world’s two most powerful militaries after that of the United States. China is undertaking perhaps the most comprehensive military modernization program in the world today, while Russia still has approximately the nuclear weapons capacity as the United States. Although trilateral security cooperation has been strong in some cases (such as securing renewal of the Nuclear Nonproliferation Treaty), it has been inadequate in other instances, such as regarding Iran and North Korea, even when none of the three countries want to see the further spread of nuclear weapons. In confrontation with Washington, Moscow and Beijing could impede realization of important U.S. goals in Asia. Both countries can, for example, veto actions of the U.N. Security Council, a point underscored when they recently collaborated to prevent the Council from adopting more stringent sanctions against Iran and North Korea for its illegal nuclear activities. In contrast, when they cooperate, the Chinese, Russian and U.S. governments can reinforce global nonproliferation regimes under strain. They also better constrain the nuclear programs of Iran and North Korea as well as discourage other national nuclear weapons programs. At the recent P-5 meeting in Vienna, as during earlier P-5 sessions, the three countries joined with Britain and France to call on Iran and North Korea to respect nonproliferation norms. China, Russia, and the United States also have the greatest ability to secure dangerous nuclear material, prevent the transit of nuclear-related items, and influence the deliberations of international and regional institutions that address nuclear arms control and nonproliferation. This is all occurring against the backdrop of the relationship between the Russian and Chinese governments being perhaps the best it has ever been. They’ve largely resolved their longstanding border disputes, as well as contained their rivalries in Central Asia, the Korean Peninsula, and other regions. 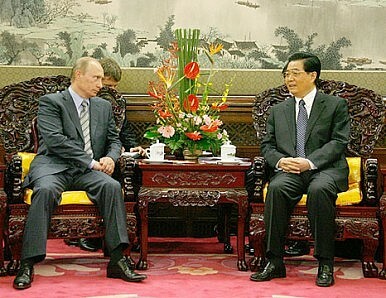 The 2001 Sino-Russian Treaty of Friendship establishes a basis for extensive bilateral security and defense collaboration. Their leaders engage in numerous high-level exchanges, make many mutually supportive security statements, and cooperate in other ways in support of what both governments refer to as their developing strategic partnership. Their growing two-way commerce and investment has made China the number one foreign trade partner of Russia, and they recently completed an unprecedented joint naval exercise in the Yellow Sea. Yet, China and Russia continue to differ on certain key issues. For a start, they’ve proven unable to resolve their differences over the price China should pay for natural gas imported from Russia. They also differ in their assessment of Pakistan. Whereas Russian government officials and analysts express concern that Islamist extremists might gain control of dangerous nuclear material from Pakistan or even seize political power themselves, China has strongly backed Pakistan diplomatically and provided its nuclear programs with assistance, helping to augment Pakistan’s potential to balance India, a country that has friendly relations with Russia but not China.